If you need a chair to help you maintain more independence, an elevating wheelchair can provide a lot of helpful benefits. These chairs come equipped with lifting technology that makes transferring in and out of the chair much easier for you and your caregiver. Since there is a lot that goes into this large purchase,it’s important to research your options and pick the right wheelchair for your lifestyle. Here are five of the best elevating electric wheelchairs. This high end standing chair is comfortable and offers all the necessary features to take the effort out of transferring. Standing wheelchairs on the market today come with a wide range of features, and this chair boasts some of the best. It allows users to move from a complete recline to an upright position in about 15 seconds, which is helpful for those who want to get in and our of their chair efficiently and without assistance. The joystick comes with an LCD screen that is easy to read and understand. The controls for this chair are also simple to use, and the chair moves smoothly in unison with the joystick. The Karman also comes with independent suspension and mid-wheel drive which allows for a tight turning radius and excellent shock absorption. The extra weight on this chair gives you peace of mind in knowing you will never roll over or fall out. This chair’s agile maneuvering in tight spaces sets it apart from its competitors. The chair has a 20-inch turning radius with mid-wheel drive so you can navigate narrow hallways and bathrooms, as well as position yourself close to your car for easy transferring. As for design and functionality, this chair is extremely sturdy and its hefty size – 243 pounds – means you do not have to worry about it tipping over or becoming wobbly This ensures you stay well grounded in circumstances where normal wheelchairs might tip. The Golden Technologies chair offers indoor and outdoor flexibility with tires that do not mark up the floor. This chair is designed for indoor use and has specialized nine-inch wheels that will scratch or damage the floor. The overall appearance of this chair is beautiful and it comes in a variety of different colors. The chair comes with footplates and armrests that can be adjusted to suit your individual needs. Even though the chair is intended for indoor use, the manufacturer claims you can use it outdoors under some circumstances, but you it may not have the traction and control you get from other chairs. The controls on the Alante Sport are also very sensitive and take some getting used to. If you struggle with arthritis or chronic pain, you may dislike the jerky movement of this chair until you adjust to the joystick. This chair lets you customize everything from headrests to footrests, meaning you can really make this chair your own. This chair has a lot of features to offer independent seniors. The turning radius is 21 inches, so you can easily maneuver in tight indoor spaces. But there is also four inches of clearance from the ground, so you can feel confident driving on rough outdoor terrain as well. The tires on the Gemini are full of foam which gives them a little bit of bounce and ultimately more traction compared to solid tires. Another thing that separates this chair is the fact that everything is customizable which is something we’d love to see more of from wheelchair manufacturers. There are so many options for sizing from the seat, the armrests, all the way down to the percentage of recline on the backrest. The footplate and headrest are also adjustable, and the seat even swivels to help get you out when you may only have one side open. From the reputable brand, Jazzy; this chair combines comfort with appearance to give you one of the best looking chairs on the market. Best For Indoor To Outdoor Use If you’re looking for a chair from a trusted and reputable company in the industry, the Pride Jazzy Air might be for you. The overall design of the chair is attractive, and it truly feels like it was designed with independent older adults in mind. This chair boasts many thoughtful features, but our favorite is the fact that you can use the lift even while you are still in motion. This allows the user to discreetly lift if they need to reach a table in a restaurant for example. The turning radius on this chair is 22.5 inches, so it allows you to navigate most spaces. One of the downsides is that you only get 15.29 miles on each charge, which is a few miles short of other models on the market. Your wheelchair is your companion when you depend on it, so you want to make sure you are getting one that meets your needs and expectations. An elevating wheelchair is a big purchase, one that many people expect to last the rest of their lives. And for many seniors, these chairs are an absolute necessity for living an independent lifestyle, so you want to make sure you find one that meets your needs and expectations. Here are a few things to consider before hitting that buy button. Because of their size, elevating wheelchairs are typically not very portable. They are difficult to disassemble and reassemble, which is something you want to consider before you purchase this kind of chair. Also, elevating wheelchairs can sometimes weigh as much as 400 pounds, and if the person cannot get in and out of their chair quickly, it will require special transportation to get them where they need to go. However, there are a few portable elevating wheelchairs that are designed to be taken apart and reassembled quickly, which would allow you to take it somewhere quickly and without too much hassle. Despite what manufacturers claim, there is no one-size-fits-all solution for wheelchairs. There are so many different size wheelchairs, but no one chair that can meet the needs of each and every individual. For this reason, we’d love to see more customizable features in future wheelchairs. In the meantime, we recommend finding a wheelchair that does have adjustable parts. The best elevating electric wheelchairs will also allow you to remove items when you don’t need them, like footrests or extra padding. Elevating wheelchairs are large due to the amount of power and components it takes to perform that action. As a result, these chairs typically have a larger turning radius, so it’s good to do some measuring in your home before making a purchase. Is your home compatible with a chair that requires 30-40 inches around to make a complete turn? Mid-wheel drive chairs tend to have a better turning radius of around 25 inches, but for some seniors that is still too much space. Even with these slightly smaller chairs, we recommend measuring before you buy. Turning Radius Elevating wheelchairs are large due to the amount of power and components it takes to perform that action. As a result, these chairs typically have a larger turning radius, so it’s good to do some measuring in your home before making a purchase. Is your home compatible with a chair that requires 30-40 inches around to make a complete turn? Mid-wheel drive chairs tend to have a better turning radius of around 25 inches, but for some seniors that is still too much space. Even with these slightly smaller chairs, we recommend measuring before you buy. Battery Range If you rely on your wheelchair for mobility most of the time, finding a chair with a long-lasting battery is essential. This will help avoid getting stuck somewhere without a charge and being forced to call someone for help. 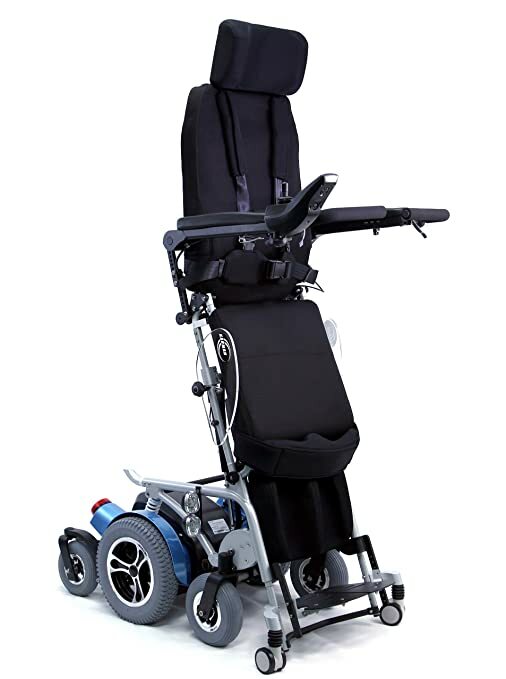 You’ll want a model that has a long battery life, not only for emergencies, but also to avoid the inconvenience of having to charge the chair frequently. Most chairs get anywhere between 10 and 20 miles of travel, but keep in mind that as the weight gets higher, the miles typically go down. Elevating electric wheelchairs are some of the biggest on the market, so which limits amount of travel between charges. f you plan on spending any length of time in your chair, you’ll need to ensure that it’s comfortable. Most wheelchairs are made with plenty of padding and comfort features, but it is still worth looking into. Take a look at things like the headrest, armrests, and back. Are they adjustable and can the padding be removed if you do not want it? The best chairs combine comfort with the versatility to meet the needs of every individual. The best chairs combine comfort with the versatility to meet the needs of every individual.